The St Kitts Nevis Football Association is once again showing their continued commitment to improving the quality of football in the Federation. 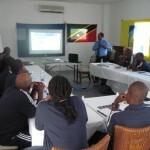 On Monday 17th January the MA Referee course began in the federation. The course is a continued effort to keep the referees up to date with the constant changes to the rules and regulation of the game. 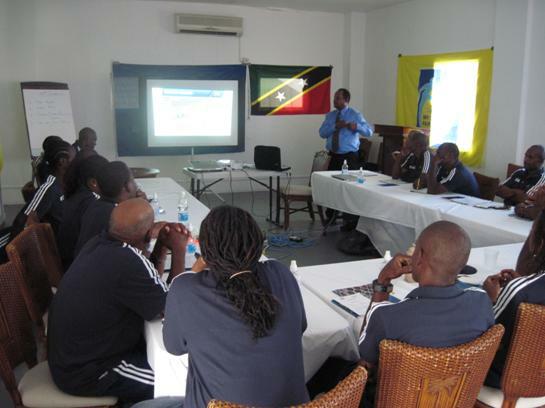 The opening ceremony was held on Monday where the Minister of Sport Glen Phillip, FIFA Instructors Ramesh Ramdhan and Peter Prendergast as well as President Anthony Johnson spoke to the referees from both St Kitts and Nevis about the importance of referee in the game. Minister Phillip also stated that he will be looking into ensuring that the equipment that are used for these courses are not charged any taxes as it has become a burden on the Association. The MA Referee Course will end on Friday 21 January, and the referees will be engaged in theory and practical session. They will also be conducting a fitness test during the course.